The summer had arrived as our u14 lads, with significant support from our u12 panel, took to the field in Sligos GAA Centre of Excellence at Scarden back in April for the local Feile competition. The first clash of the day was against St John's where victory led us to meet St Mary's. A second win saw us face Calry/St Josephs in the semi-final. With a place in the final secured, Eastern Harps once again came face to face with the men from St Mary's, and the battle for the Feile Peil na n-og 'B' title was on. After a long day of football the legs were weary but the will was strong. A great display of skill and character ensued, and at last the final whistle was heard, a great cheer went up from the side-line.... We were heading for the sunny south east, but not before some well deserved refreshments generously sponsored by Ivan and Veronica Campbell!! We'd gotten a taste of the sun right there in Scarden, and some of the weary legs were also turning a grand shade of pink!! The work behind the scenes got underway immediately, because as we all know it's a major operation preparing for three days away. We found out we were going to somewhere in Carlow, Muinebheag GAA in Bagenalstown. I don't know if an actual map came out in any house in the Harps area, but Google was put under pressure as we all went off to see where we were going, and accommodation was soon snapped up by supporters down there in Carlow and Kilkenny. Our able coordinator Damien Mc Govern made contact with his counterpart in the sun, Sean Hannifin. Damien is known for his attention to detail, and much to his relief discovered that he was dealing with someone of the same ilk, so all the bases were covered. Within days of qualifying for Feile Peil na nOg, one of the Club Premium Sponsors, East Brothers Garden Machinery came up trumps once again, when in conjunction with Garden Care they very kindly sponsored gear bags for the U-14 players. Thanks to Bord na n-Og who took responsibility for overseeing the fundraising end of things to cover the various expenses associated with Feile, as well as taking on some of the organising much to Damiens relief. The primary fundraiser was the tried and tested sponsored walk, with the lads scouring the Harps countryside collecting every euro they could, well done lads. A sincere thanks also to Kevin & Brid Higgins, John Higgins Snr & Eamon Clarke for their very generous donations towards Feile costs. Not too much sleeping was done on the night of June 25th, and the time to catch the bus couldn't come fast enough. We were fortunate to have one of our own as our bus driver. Sean Higgins was relaxed and good humoured throughout the weekend, despite the long days and I’m sure at times high decibel levels, and we are most grateful to Sean for giving freely of his time. The boys looked smart upon arrival in their new tops, as they loaded their new gear bags into the back of the bus, before racing for the back seat. Proud parents came to see their sons off, and tried hard to get a nice photo of the big adventure and a last hug. The sons tried equally hard to avoid these photos and struggled out of the public hugging as fast as they possibly could. They gave each other knowing looks as the bus pulled away from waving parents, but they all gave a look out of the bus and a little wave good-bye just the same! The journey south involved a convoy, and as the miles flew past the temperature rose. Eventually we spotted our name! "Welcome Eastern Harps from Muinebheag GAA"
the signs said. We had reached Mc Grath Park and knew we were home from home when we saw the Sligo flag flying high next to the Carlow one....and we were able to leave our jackets in the car. First up were St Josephs of Wexford. Though we were a little “buslagged” and heading into the unknown we warmed to the task admirably and gained our first points in the competition on a scoreline of 3-9 to 1-1. Solid defensive performances from Diarmuid Higgins, Kacper Grendza, Robin Richardson and midfielders Luke Hogge and Donncha Byrne laid the foundations for an impressive victory. Next up after a short break was Clondegad and the men from “The Banner “ proved much tougher opposition. After a cracking game we defeated the boys in black and white 2-8 to 2-3 with impressive displays from James Campbell, Killian Burns, the Connolly brothers - Seamus and Eoin and Cormac Kielty. One of the highlights of the game was an excellently worked goal with Eoin Dowd providing the final pass for his younger brother Diarmuid to finish expertly to the net. It was during this game that the coaches enjoyed one of the most amusing statements of the whole weekend, when one of our players jogged wearily out towards the side-line and said “take me off, this fella has me f-ing killed”. The games done for the day, the lads emerged from the dressing rooms clutching pieces of paper to give to their parents. These little notes contained the host families contact details, and they were a great touch, and helped our parents relax, reassured in the knowledge that their “boys” were in safe hands. Everyone met their "Second Mammies and Daddies" for the weekend as well as their new housemates. We all headed off to The Railway Bar where another big feed was laid on for both teams and their mentors. It was also here in the local tavern that many of our supporters were treated to an enjoyable history lesson from the barman/owner, complete with an array of artefacts on display behind the bar, including the renowned pole-axe, something most of us have heard rumoured to have been done to players on GAA fields for years. The two teams were well on their way to blending together, but there was a good bit of sussing out and sizing up going on too, after all, there was a battle to be had in the morning. In hindsight we have to wonder exactly what took place in homes across Bagenalstown on that Saturday morning? Whatever about trying to outwit the players and coaches from our host Club, we certainly hadn’t counted on the Muinebheag Mammies. They had us sussed. After a light breakfast of the finest Carlow rashers, sausages, black and white pudding, hash browns, onions, mushrooms, brown and white toast, chips and fried spuds, our players, looking a little bloated, made their way to the pitch. Despite the collective scratching of heads on the sideline, our mentors were helpless!! Were they under the same spell or... was it something else??? Does this sound like a lame excuse or taste of sour grapes?? Of course it is...we were hammered off the pitch by a fine young Muinebheag outfit...but we all agreed it was the finest Full Irish we had ever tasted. 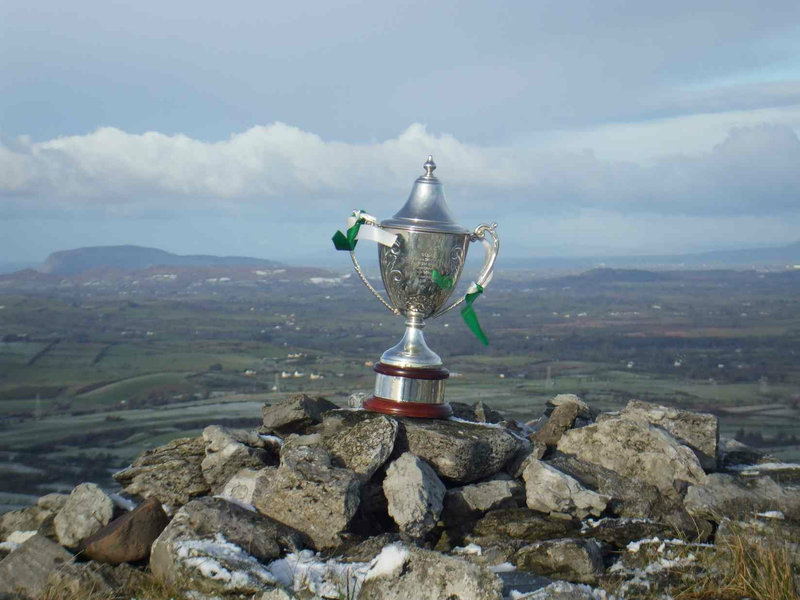 Playing with the aid of a strong breeze the Wicklow men in the famed green and red of Rathnew took full advantage and hit us with two early goals leaving us in a seemingly impossible position. However our boys showed their true mettle and scores from Kyle Cosgrove and Eoghan Higgins brought us right back into contention. With the younger speedsters Dylan Walsh, Matt Henry, Finn Bruen and Caelan Hunt running riot at this stage and Michael Kielty-Mc Manemy having the game of his life in the half back line, we began to dream of a semi-final spot. With time running out, James Kiernan, probably the youngest player on the field, made a heroic block (that any senior inter-county player would be proud of) on a shot at goal, which set up our final attack that resulted in us being awarded a 30m free and sure enough our leading marksman split the posts. We had qualified on a scoreline of Harps 2-5 Rathnew 3-1. The celebrations were jovial, with as much satisfaction and delight on the side lines as there was on the field. We got ourselves together and headed back for Carlow, to be treated to dinner once again by our hosts. Then it was time to let our hair down and have a party! Back we went to The Railway Bar for a disco and some speeches. Firstly the Muinebheag Chairwoman took to the stage looking fantastic - she had just left another party nearby to welcome us, and she called on our own Padraig Henry to say a few words. He too was looking fantastic, but I'm afraid in the style wars he was beaten by RoseMarie on the night! Next the presentations, and what presentations they were. Firstly C.L.G. Muinebheag presented us with a beautiful crystal football & stand. Then, each and every one of our lads were presented with a t-shirt bearing both Clubs logos, Eastern Harps and Muinebheag. They also received a Muinebheag wristband & pen. This was a most thoughtful gesture from a most thoughtful Club. The two teams were by now fully integrated and the craic was mighty as they danced away. But the night had to come to an end reasonably early, as we weren't finished with the football end of things yet, as we were playing in an All-Ireland semi-final early Sunday morning. We had great support in Carlow, but not just from Sligo, we were delighted and very thankful for such enthusiastic support from our hosts too. Against the breeze in the first half we struggled against a physically stronger Silverbridge outfit from Co Armagh. The concession of early goals left us on the back foot heading into the second half. A Kieran Breheny special to the net brought us back into contention but despite our very best efforts we were beaten by a better team on the day on a scoreline of Harps 2-2 Silverbridge 4-6, with the Orchard boys going on to win the final of the competition in convincing fashion. Though beaten our lads had done their club and county proud and gained many friends and admirers along the way. And so it ended as it began, we retraced our route back towards Sligo with a bus load of happy but tired lads, stopping on the way for some refreshments, very kindly sponsored by Padraic Henry. The temperature began to drop as we headed west, but there was a different warmth to be felt on the homeward bound journey, and it's a warmth that no sun can replicate. We had set out on an adventure, to visit and play football with complete strangers. They weren't strangers for long, as they welcomed us into their homes and lives for a brief time. Where else would you get it, our sons welcomed like family, us adults treated like friends. Anything our hosts could possibly do to make our stay enjoyable was done and much appreciated. The old saying a picture paints a thousand words springs to mind, and we cannot thank our photographer Aisling Stephenson enough for the hundreds, maybe thousands of photos taken over those few days, which so appropriately captured every aspect of a wonderful weekend and will be treasured for years to come. GAA is all about community, and the way in which this was displayed over the Feile weekend was commendable and unforgettable. So many people came together to make it such a success and the atmosphere for the three days was electric. After a weekend like that it makes us all proud to be part of the GAA tribe.